Detroit's gargantuan motor show starts on 9 January. When the doors open at 6am on Monday, more than 5,000 journalists from 50-plus countries will descend on the city's Cobo convention centre for a first look at the hottest new vehicles. 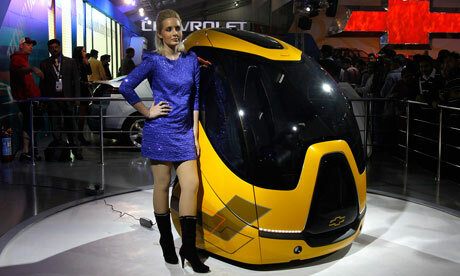 Once again the world's top car firms are showcasing electric cars and hybrid vehicles. BMW, General Motors, Lexus, Mercedes, Nissan, Toyota, Volvo – all have new electric or hybrid cars to show off. As usual they will garner huge amounts of coverage. But will anyone buy them? The signs are not good. Last year GM's Chevy Volt was named car of the year at the Detroit auto show, beating the Nissan Leaf. The Volt runs on a combination of battery and old school combustion engine, the Leaf is all electric – they were heralded as the first mass market electric cars. Neither has proved a hit with consumers. Both missed their 10,000 vehicle sales targets for the year, Nissan by a fraction and Volt by more than 2,000. By comparison, Toyota sold 308,510 Camrys last year. As if to rub it in, the new year got off to a bad start for the Volt, with GM asking owners to bring in their cars to dealerships after problems with their batteries. Do these baffles work and has anyone tried them? Quick Reply: All these electric cars – who's going to buy them?